Pretty much every survival instructor agrees that the knife is the most important piece of survival equipment there is. Unfortunately, that’s where the agreement ends, because opinions on the type of knife that’s best for survival are as varied as the people who hold those opinions. While there are a few common points of agreement, they are very rare, with the points of disagreement far outnumbering them. It’s not that the differences are all that great either. They are minor differences, when one truly understands what is required of a good survival knife. But those differences can lead to extensive discussions about the pros and cons of particular knives, with no agreement ever reached. Ultimately, the best knife is the one that you are comfortable with using. What works for one person, may not be the best choice for another. Differences in blade size and shape may reflect different ideas of how to survive, as well as the individual’s skill with a knife. Differences in handle design can be as varied as people’s hands. In each and every case, the best knife has to be one that the owner likes working with. 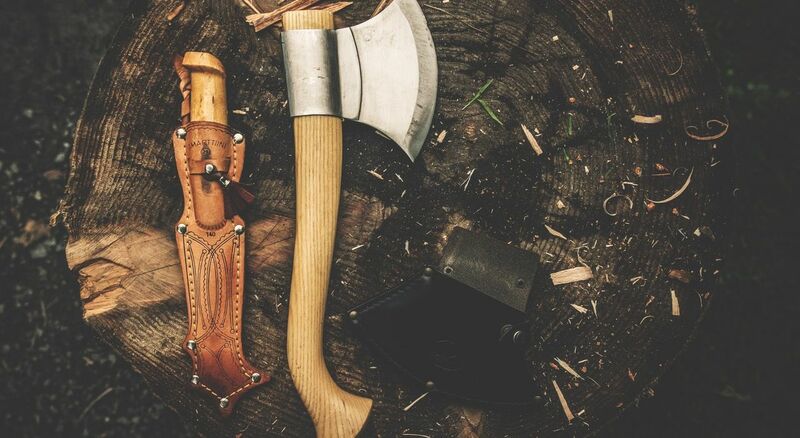 Let’s look at the various important aspects of survival knives, so that you can have a better understanding as you begin your search for your ultimate survival knife. The most important aspect of any knife is the kind of steel it’s made of. High quality steel will hold an edge longer, allowing you to use the knife more and sharpen it less. Of course, the harder the steel, the harder it will be to sharpen, requiring more time to form an edge. If the steel is too hard, then it can become brittle, making it easier to chip the blade when coming in contact with something hard. On the other hand, a softer steel will be more likely to bend, rather than chip, when it comes into contact with that same hard object. It will be much easier to sharpen, but a soft steel won’t stay sharp long. You’ll constantly have to resharpen it, just to be able to work with it. Today’s knife blades are mostly made of some sort of stainless steel. Steel is usually made stainless by adding chromium to it, making it impervious, or at least partially impervious, to rust. Stainless steels tend to be hard, but they don’t necessarily hold an edge well. The mixture of different alloys tend towards brittleness, without giving the necessary hardness for holding an edge well. High carbon steels are the best for holding an edge, but tend to rust easily. In times past, all high-quality knife blades were high carbon steels. While you can still find a few knife blades that are high carbon steel, they are rare. Damascus steel is very common, especially in high cost, handmade knives. The term “Damascus steel” refers more to a particular process, which was developed in Damascus, rather than steel that actually is made in that city. The steel is multi-layered, like a Japanese Katana, but the layering is much more obvious. Two different grades of steel are bonded together in the layering process, one softer to give the blade resiliency and the other harder to hold an edge. These blades are easy to spot, as the wavy pattern of the layering process is easy to see. 440C – This high carbon stainless steel is one of the most common types you can find in production knives. It balances edge retention, corrosion resistance and ease of sharpening. This steel typically has a Rockwell hardness of 58-60. ATS-34 – This is a very high carbon stainless, with chromium and molybdenum in it. That gives it good edge holding properties, as well as corrosion resistance. However, it is hard to resharpen. Rockwell hardness for this steel is 60-61. AUS 8A – This is a high carbon, low chromium stainless steel, which has proven itself to be the best compromise between toughness and strength; it has both excellent edge holding ability and resistance to corrosion. The Rockwell hardness for this steel is 57-59. CPM 530V – This steel was specifically created to satisfy the needs of the knife industry. Its powder structure gives it extreme uniformity throughout the blade. This steel boasts excellent edge retention and overall toughness. It’s balance between corrosion resistance, edge retention and sharpenability make it one of the best knife steels around. Rockwell hardness can vary from 58 – 60. Damascus – As already mentioned, Damascus steel is made of layers of dissimilar steels bonded together. The high labor required to make this steel makes for very expensive blades, normally used for decorative purposes, more than anything else. However, it does have excellent toughness and edge holding capabilities. Rockwell hardness of Damascus steel varies considerably, due to the two types of steel used. It can vary from 53 – 62. Sandvik 12C27 – Made only in Sweden, this steel is considered by many to be the finest knife steel in the world. It offers excellent capabilities in all categories; sharpening well and holding and edge well too. It is inherently very tough. Rockwell hardness is 57 – 59. Not all manufacturers tell you the type of steel used in their blades; however the upper end blades typically will mention it as a selling point. Manufacturers select the steel which they feel will provide the best combination of qualities for each knife they make. It is up to you and I to decide if they are right. The blade of the knife is obviously the most important part; what we could call the “working part” of the knife. But when we talk about the blade, we’re not just talking about the edge and shape, but all the metal in the knife blade, seen and unseen. For survival purposes, one of the most important features of a knife is that it survive too. A blade that breaks when you need it is worthless. For that reason, most survival experts and instructors agree that fixed blade sheath knives are far superior to folding knives. While most quality folding knives are rugged tools which will last a lifetime, they can’t take as much pressure as a sheath knife without breaking. The part of the blade which is hidden in the handle is called the “tang.” This part plays the important role of transmitting your hand’s pressure to the tip and edge of the knife. A quality knife will always have a “full tang,” which means that the tang runs the full length of the handle, unbroken. A partial tang or short tang will most likely break under severe use. Knives which contain storage in the handle, such as the waterproof match containers that are included in some “survival knives” are never full tang knives. So, while it might be convenient to have those extra matches in the handle of your knife, the possibility of breaking the knife makes that too high a price to pay. These types of designs come from the movie industry, where visual appeal is more important than actual function. While they may scare an opponent in a knife fight, they won’t serve you well as a survival tool. Drop point – This might be the most popular blade design there is for a survival knife. The back edge of the blade is thicker, making for a stronger knife. This edge is curved, with the point being a little less than halfway through the width of the blade. However, unlike most fighting knives, the blade is only sharpened on one edge. This point design provides for a strong point, although it isn’t as sharp as some designs. Clip point – Clip point knives have what appears to be a cutout on the back edge of the blade, reaching from the point to anywhere from one-third to halfway back the blade. This cutout provides the means of having a sharper point on the blade, for piercing, while still keeping thicker metal for blade strength. Tanto point – The tanto point is paterned after the famous Japanese Katana sword. Rather than a curve that leads to the point, the point is clipped or angled. This provides for a much stronger point, albeit one that is not as sharp. Sheepsfoot – This blade design is rather uncommon, but highly useful for cutting and slicing. The edge of the blade is straight, with the back edge curving to the point. By providing a flat edge the sheepsfoot makes it very easy to control the cut. Needle point – This is the classic dagger design, intended more for fighting, than actual survival uses. It is a stabbing blade, more than a slicing one, although both edges of the blade will be sharp. The problem with a needle point knife is that is breaks easily. Spear Point – Between World War I and World War II a British commando, acting as a police officer in China, came up with a new fighting knife style. Rather than the sharp point of the dagger, he curved the two edges of his knife to a point. Both edges were still sharpened. This still made for an excellent stabbing knife that was much stronger than the dagger. It also works well for a cutting knife, although you can’t place a thumb on the back side of the blade for leverage, as it is sharp. Of these blade designs, the drop point and clip point are the most popular for survival, with the drop point having a slight advantage, due to its superior strength. Tanto point knives are beginning to gain in popularity, but have by no means come close to replacing either of these popular styles. It’s easy to think in terms of “the bigger the better” when thinking of knives. In reality, a big knife is more useful for impressing people (as in the movie Crocodile Dundee) than it is for any practical purposes. I suppose that a long blade would make a better sword, but if you want a sword, then why not carry one? Typically, a blade length of 4 1/2″ to 5 1/2″ is all you need in a good survival knife. This is large enough that you can use the knife for butchering or fighting effectively, while making it small enough to control. Large knives are harder to control, especially when needing to make fine cuts, such as for making a buckskin shirt. Blade thickness can tell you a lot about the quality of a knife. Thicker blades offer the advantage of being stronger than thinner ones. But it costs more money to use that thicker steel for making a knife. So, you are only likely to see it used on more expensive knives. When comparing knife blades, one thing you should always look for is the thickest point in the blade. The blade that is thicker, is probably better made. Sometime in the last 20 years or so, serrated knives became more popular. Originally, serrations were only used for cutting meat and were found on steak knives and knives intended for cutting roasts. However, many pocket knives and sheath knives now come with partially serrated blades. The idea is that a serrated blade can be used as a small saw, for cutting tree branches to make a shelter. This is very much a point of contention and personal opinion in knife design. The serrated portion of a blade takes from the overall cutting portion of the blade. While it does cut some materials better, it really isn’t long enough for cutting branches that are thicker than your thumb. It also means that when it comes time to butcher a deer, you actually have less of a knife blade to work with. Personally, I’m not a fan of serrated knife blades, although many people like them. You will have to make your own decision on this one. But do so based on trying them out and working with them, not based on how cool it looks. Knife handles can be made of just about any material you can imagine. Wood and antler are the more traditional materials; as well as bone, although bone was never as popular. Today, most knives are made with some sort of synthetic material. This helps to keep the cost of the knife down. It also usually makes for a knife that is easier to hold onto, as the synthetic materials are textured on some way. The most important part of handle design is that it be comfortable in your hand. At times, you will be working on things that require holding that knife for hours at a time. When that happens, you’ll be glad that it’s comfortable. You also want to make sure that it is comfortable to hold in a number of different ways, as you may find yourself holding the knife differently when fighting, than you’d hold it while skinning a deer. A rubberized coating on the handle can make it more comfortable, as well as making it easier to hold onto when it is wet. The added padding of the rubberized coating will make it more comfortable to hold as well, especially for prolonged periods of time. While not technically a part of the knife, always take a good look at the sheath that comes with it. More than anything, you want that sheath to protect you from being cut while carrying the knife. At the same time, it should be convenient for use, with the knife slipping in and out smoothly. Some sheathes have a spring clip in them, to prevent the knife from falling out. This is more common with fighting knives, which are likely to be carried in a variety of ways, including with the handle pointing down. You can always change a sheathe if you don’t like it, but that will add to the overall cost of your knife. So, if you don’t like the sheathe that comes with it, factor the cost of the new sheathe in, before making your decision.